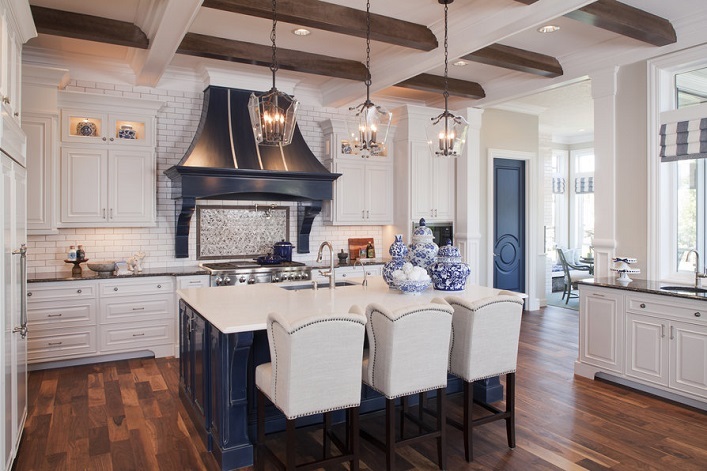 Such a gorgeous, gorgeous kitchen! This kitchen is part of the Highland Couture house, built by Pahlisch Homes for the NW Natural Street of Dreams. Evoking a sense of warmth and timeless elegance, this space also oozes character and luxury. I am particularly drawn to the beautiful ceiling, the lovely light pendants, the fabulous counter stools and the striking kitchen hood. The classic blue and white color palette combined with the timeless furnishings is a wonderful marriage made in design heaven. I think I just found my dream kitchen! Are you obsessed with this kitchen as much as I do? Your thoughts?